Adelaide, Australia, October 27, 2007 — The SINAG solar car arrived at the finish line of the World Solar Challenge (WSC) with over a day to spare –a remarkable achievement for the Philippines’ first solar car to compete in this gruelling 3,000km race against 40 other entries from around the world. SINAG arrived in Adelaide at around 4pm, well before the 5pm cut-off for the day. “The Philippine flag has reached Adelaide!” proclaimed SINAG Technical Head Engr. Rene Fernandez as the car crossed the finish line, greeted by a small crowd of Filipino well-wishers carrying small flags of their own. 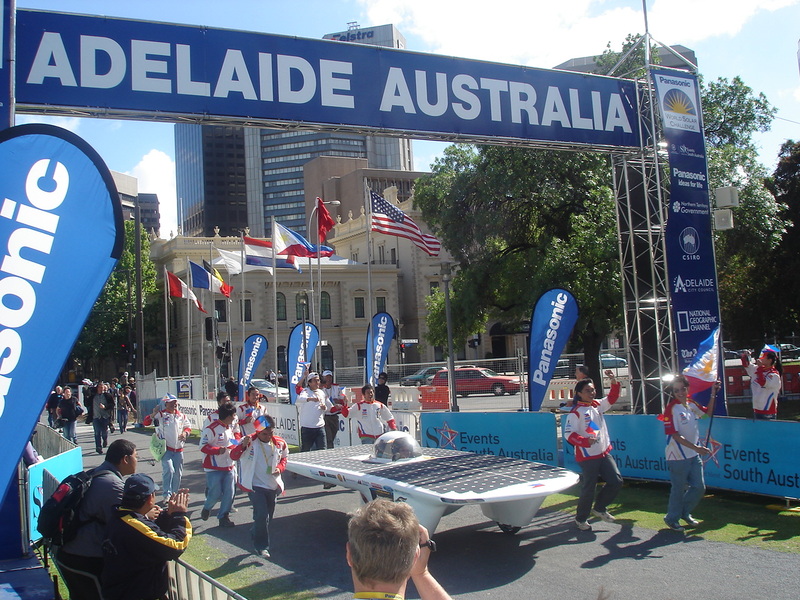 The all-Filipino Team SINAG was warmly welcomed by the Lord Mayor of Adelaide Michael Harbison and by Hans Tholstrup himself, the founder of the WSC and the first person to cross Australia in a solar car, The Quiet Achiever. Team SINAG also got to meet the members of the Nuon Solar Team from the Delft University of Technology, the multiple successive winners of the WSC. The official results and rankings of all the WSC competitors will be tabulated and announced at the Awarding Ceremonies to be held at 4pm on Sunday, October 28, at Adelaide’s Victoria Square. “SINAG is bringing home the torch of pride for Filipinos everywhere. The members of Team SINAG braved and endured, borne by the hopes and prayers of our countrymen who have stood by them every step of the way,” said Philippine Solar Car Challenge Society (PSCS) Chairman Vince Perez. Since arriving in Australia just over two weeks ago, the team achieved its first triumph when SINAG passed the strict Scrutineering and Qualifying events to compete in the Challenge Class of the race. The car’s competitors included similarly high-tech entries from universities and organizations around the world. SINAG performed exceptionally well from the moment it left the starting line in Darwin on Sunday, October 21. Needing only minor adjustments to its brake system, the Philippine solar car quickly jumped to 11th place overall. The team maintained this position and made excellent time, passing the halfway mark at Alice Springs on Wednesday, October 24, and breaching the 2,000km mark at Cadney Homestead the following day. By the evening of Friday, October 26, the team had already made its way to Glendambo, the second to the last stop –less than 500km from the finish line. Team SINAG made it in high spirits to Adelaide on Saturday, ahead of more than a dozen rivals. “This has been a dream come true for all of us! All the months of hard work and preparation really paid off. We managed to do more and go farther than any of us thought possible,” enthused Eric Tan, SINAG’s Lead Driver. 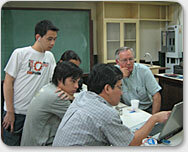 “SINAG weathered the course far beyond any of our expectations. It’s positive proof of not only the car’s solid design and construction, but also our own capability to successfully deploy solar power technology in the Philippines,” says Engr. Fernandez. Homegrown Filipino talent is behind every aspect of the SINAG solar car, from its sleek monocoque shell to its dynamically adaptive electrical system. Even the car’s unique back-contact monocrystalline solar cells, which are among the most efficient commercial solar cells in the world, are proudly Philippine-made in Laguna. The SINAG Solar Car was proudly designed and built from scratch in a record time of less than a year by students from De La Salle University –Manila with the support of Ford Group Philippines, Motolite, Philippine Airlines, San Miguel Corporation, Pilipinas Shell, SunPower, U-Freight, and Ventus. The project is also supported by Aurora, Cabrera Lavadia and Associates, JWT, CreAsia, Merritt Partners, Tuason Racing School, Gochermann Solar Technology, and Stratworks.